Deserted streets, overhead canopies bulging with rain water and the church bells ringing out for longer than usual – there’s a strangely damp, sombre feel to Órgiva today. 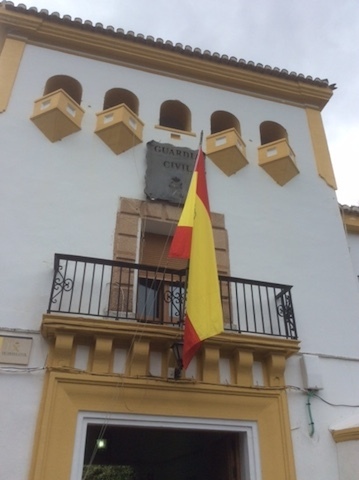 Earlier, dressed in dark green and marching to a funeral-like drum, the Guardia Civil band headed up Calle Doctor Fleming to their base on Plaza Alpujarra. A small throng gathered in their Sunday best to witness a simple ceremony: the raising of the Spanish flag. 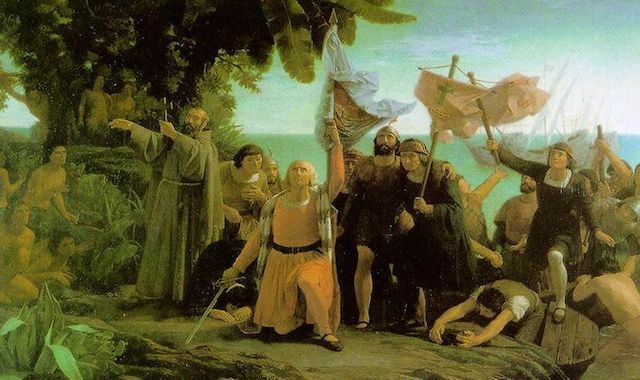 Today (12 October) is a special day; it’s the Fiesta Nacional de España which commemorates the date, in 1492, when Columbus first felt New World sand between his toes. In 1935, when the date was first celebrated, it was known as Dia de la Hispanidad, but changed in 1987 to become a broader ‘national holiday’, thus removing the tacit nod to Spain’s colonialism. However, many countries celebrate it including, of course, much of Latin America. 12 October is also the Day of the Armed Forces, of which the Guardia Civil, founded in 1844, is part (more on this another day). Oh, and it’s M’s father’s birthday today – Happy Birthday Dad! After the flag was raised everyone cheered Viva España! (we think) three times – after which we launched into our own loud rendition of the song of (almost) the same name. Here’s a clip of the band leaving the building – note the man at the back taking things very seriously by puffing on a cigarette – followed by the blowing of trumpets. « To Trevélez – con jamón! Yea! And a day off work! Yes, but tomorrow is a holiday….